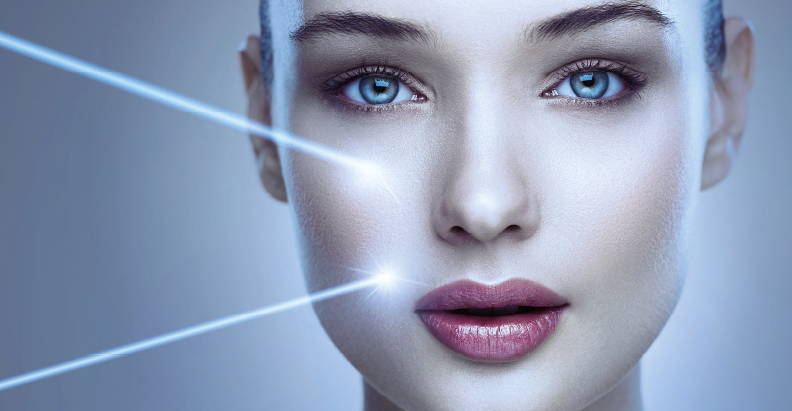 Home » Peer-Review » New anti-ageing laser applications: less is more? 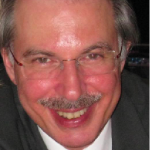 Leonardo Marini discusses how the technological evolution of laser and light-based systems allow practitioners to offer subtle, more tailored skin rejuvenation treatments. Skin ageing is an unstoppable, progressive biological event affecting all living entities. It is linked to a complex series of clinical and functional alterations strongly dependent on an individual’s genetic background, as phenotypes differ from population to population. Personal lifestyle, cultural habits, economic status, and environmental exposure can accelerate or decelerate its progression1. The multi-factorial ageing process generates heterogeneous phenotypes — different in each organ system — where the rate of ageing can be quite varied, simulating very complex, progressively changeable, dynamic ageing mosaics2. Ageing can be imagined as a progressive losing battle between potentially destructive processes acting on cells and organs during their lifetime, and the biological responses protecting and promoting good cellular function and homeostasis. 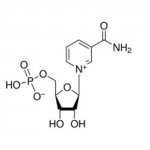 Ageing processes involve a progressive accumulation of damaged macromolecules in living cells. Chemical damage induced by oxidative stress and protein glycation may negatively interact with cellular DNA. It has been postulated that degenerative cell alterations observed in ageing cells may be exacerbated by a declining heat shock response3. The human body and its organ systems can survive different forms of intrinsic and extrinsic stressors thanks to an innate, adaptive response that can express itself in two ways: a positive strengthening of cell function, following repeated, low grade, potentially noxious exposures — this reaction is known as hormesis; and a less efficient cellular response, leading to progressively modified cellular homeostasis, ultimately affecting cell survival, when facing high intensity noxious exposures4. A possible strategy to promote healthy ageing and longevity could focus on identifying suitable sequences of low grade exposures to stressors to be periodically administered to specific organ systems, with the aim of triggering a positive adaptive, hormetic cellular response. Like any other organ systems, the skin ages spontaneously through a process known as intrinsic or chronological ageing; a time-dependent biological process leading to gradual changes in its micro- and macro-components, which gradually decrease its capacity for efficient adaptive responsiveness, wound healing, and resistance to biological disorders. In addition to intrinsic factors, natural skin ageing is also ‘dependent’ on epigenetic mechanisms and is deeply affected by environmental factors, where sun exposure (mainly UV and IR light affecting both keratinocytes and dermal fibroblasts ), tobacco smoking, and nutrition play important roles. These factors are primarily responsible for the so called extrinsic skin ageing. When chronological ageing is combined with extrinsic ageing, a premature form of skin ageing is produced5. Clinical modifications related to ageing are clearly visible in human skin, where wrinkles, laxity, dryness, and irregular pigmentation are progressively noticeable6. Ageing is different between genders since post-menopausal women lose up to 2.1% of skin collagen — roughly corresponding to a 1.13% decrease in dermal thickness — per year, during the initial 15–18 years following menopause7. This particular behaviour is strongly linked to a progressive decrease in oestrogen levels7. Microscopically, ageing skin shows a gradual flattening of the dermal-epidermal junction, associated with hypo-trophic, hypo-elastic dermal connective tissue, surrounded by a quantitatively and qualitatively reduced extracellular matrix. All these alterations lead to a progressive decrease of dermal thickness8. Two different subpopulations of dermal fibroblasts, with different biological capabilities, have been identified: superficially located fibroblasts within papillary dermis (Fp), and deeply located fibroblasts within reticular dermis (Fr)9. Fp have shown a much higher growth rate in culture than Fr, which are less responsive to growth factors such as basic fibroblast growth factor (bFGF) and transforming growth factor beta-1 (TGF-β1)10. Aged skin shows a progressive replacement of Fp by Fr, leading to the characteristic microscopic findings observed within older dermal layers. This cellular modification seems to also affect the epidermal morphogenesis along with its basement membrane, through a diminished secretion of keratinocyte growth factor (KGF)11–12. When considering a reactive stimulation of collagen production to counteract progressive dermal thinning associated with skin ageing, we should not forget the importance of keratinocyte-fibroblast interactions. Keratinocytes have shown a specific ability to actively interact with dermal fibroblasts during wound healing, stimulating them to synthesize growth factors, which in turn stimulate keratynocyte proliferation, in a double paracrine manner16. Light sources, radiofrequency (RF) and high intensity focused ultrasound (HIFU), can all generate controlled heating within living tissues when properly administered. This heating may be selectively confined to specific micro-anatomical structures, or involve the bulk of them through a volumetric thermal exposure. When tissue temperature is kept within a physiological range, cellular functions fulfil the requirements of the whole body during rest, activity, and stressful events, within a broad range of environmental conditions. This complex homeostatic control is regulated by a highly sensitive biological thermostat. Localized, exogenously delivered thermal exposures are able to temporarily ‘separate’ living cells, belonging to selectively identified anatomical areas, from the body’s natural thermal controls, inducing specific biological reactions that can modify the architecture of the treated tissue. When tissue temperature rises beyond 55°C, during a suitable time interval, HSP response is suppressed and cells are destroyed. When localized temperature surge reaches 42°C and heat is maintained for suitable time intervals, HSP response is activated and cells enter a ‘fortifying reaction’ according to the hormetic cellular response17. Lasers and medical light sources can generate highly specific light emissions, able to generate micro-anatomically localized temperature increases when interacting with specific endogenous chromophores, such as melanin, haemoglobins, water, and porphyrins, as well as exogenous chromophores, such as those contained in tattoo pigments. Temperature increments are related to laser and medical light parameters (power, spot size, irradiation time, and repetition rate) as well as tissue characteristics (absorption and scattering coefficients, density, heat capacity, and thermal conductivity)18. Different tissue responses can be generated by controlled temperature increments to the original sites of light absorption. An ablative response can be induced when superficial epidermal-dermal light absorption is used, and a non-ablative response can be triggered by deeper dermal/sub-dermal light absorption. Modern technology allows for interesting combinations of pulse energies and energy modulations over a range of laser pulse intervals, providing high levels of versatility during photo-thermal skin treatments. Operators can remove targeted thicknesses of epidermis, with minimal or no thermal effects on surrounding tissue, or generate a relatively high thermal effect within epidermal/dermal targeted tissue without, or with minimal, removal of epidermal layers when advance pulse modulation is applied to ablative lasers (Figure 1)19–20. 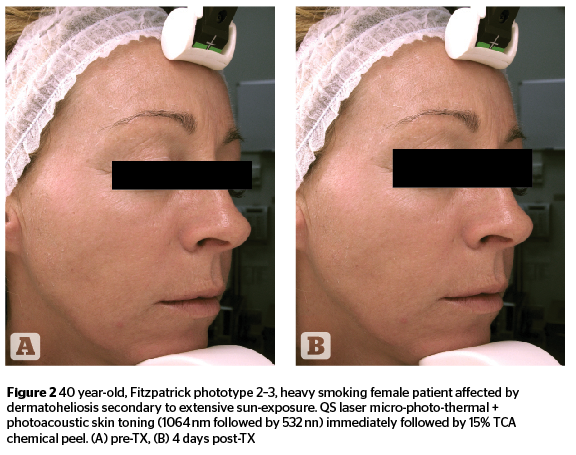 Fractional laser technology undoubtedly helped to further modulate the photo-thermal effects induced by ablative and non-ablative laser systems21–23. Operators may now choose, besides energy and pulse characteristics, the stacking and density of micro-thermal-zones (MTZ) generated by fractional laser delivery; increasing tissue thermal effects when MTZ are denser and higher in stacking repetition, and decreasing them when MTZ are more sparse and lower in stacking sequences24–28. Some technologies can even combine non-selective, volumetric thermal heating generated by bipolar RF, and fractional laser ablation, with the aim of increasing the synergistic effects induced by the micro-epidermal/dermal damage and hormetic fibroblast bio-modulation29. Ultra-short pulse lasers, like Quality-switched (QS) and Picosecond (PS) systems, can generate highly specific photo-thermal responses within living tissues, due to the unique way they deliver high peaks of light energy during an extremely short time period — within the range of nanoseconds (4–10 ns) and picoseconds (0.5–0.9 ns). Skin tissue exposed to this kind of light irradiation has to deal with micro-thermal and micro-mechanical pressure shocks known as photo-acoustic effect. Biological response to thermo-mechanical combinations induced by ultra-short pulse lasers are quite different from those generated by purely photo-thermal light exposures. 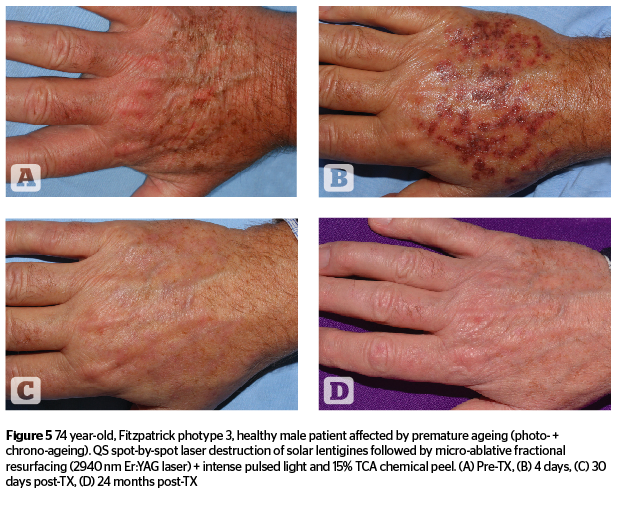 Their complete clinical outcome, in terms of skin rejuvenation, is still to be fully discovered even if present results are very promising30–33 (Figure 2–3). These laser systems can also be used as ‘super-selective’, pigment-specific, micro-destructive tools to effectively remove exogenous pigments, like those contained in tattoos, as well as endogenous pigments like melanin, when relatively high levels of energy are used34–35. QS laser systems can also deliver their light energy in full beam-mode or in fractional-mode, to produce highly controlled photo-acoustic, micro-thermal cellular stimulation through an extremely delicate hormetic cellular response when very mild energy levels are used36–38. Intense-pulsed light technologies have been identified as alternatives to laser systems, and have evolved quite significantly over the last twenty years. Their specific light-tissue interaction is generated by the absorption of pre-selected spectral bands able to interact with multiple endogenous chromophores at different depths within skin tissue. Special filters allow a specific limitation of the original xenon lamp emission (420–1,200 nm), which is the light source of intense pulsed light systems, within a specific range of wavelengths. These spectral bands are suitable to deal with specific micro-anatomical targets while avoiding, or strongly limiting absorption by ‘innocent’ chromophores not targeted by selective treatments. Highly sophisticated, computer controlled discharges of energy, responsible for time-adjusted xenon lamp emissions, can guarantee a very uniform light emission throughout the full duration of the intense light pulses. Advanced systems can presently go as low as 0.5 ms in pulse duration39–41. 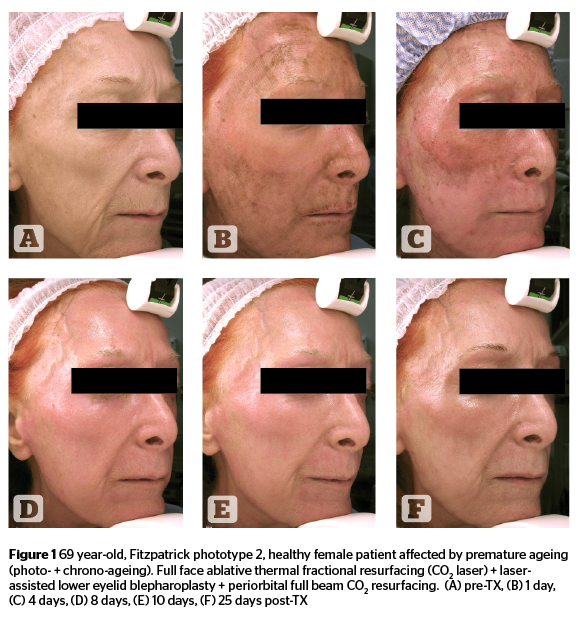 Intense pulsed light systems can be effectively used, either alone or in sequential association, with non-ablative and micro-ablative laser technologies, occasionally accompanied by a superficial chemical peel, as described by the ‘photo-peel’ technique. (Figures 4–5). Age-prevention is a concept that is becoming quite well accepted by socially active people in the early stages of their ageing process, as well as in patients that have already undergone some sort of age-reversing skin treatment aimed at rejuvenating their skin. In the first example, we can talk about primary age prevention, while in the latter, secondary age prevention would be a more suitable term. Primary age prevention will focus on slowing down the signs of ageing, mostly on sun exposed areas, such as the face, neck, décolleté, and hands. Secondary age prevention will try to keep clinical improvements, achieved after personalized treatments aimed at correcting already evident ageing signs, for as long as possible. Primary and secondary age prevention should have a common strategic approach, which is aimed at achieving an ‘elegant ageing’ process. Just the right amount of technology, ‘seasoned’ with an expert touch, provided by experienced physicians dealing with the quite complex biological phenomenon of skin ageing, is what people desire. Age prevention is a ‘work in progress’ since ageing is a constant evolution. Proper prevention can be obtained through periodic, personalized, minimally invasive treatments associated with short or ultra-short downtime and minimal side-effects, to allow patients to ‘train’ their skin cells to produce more collagen, while keeping the epidermis and dermal-epidermal junction at the best of their biological efficiency. 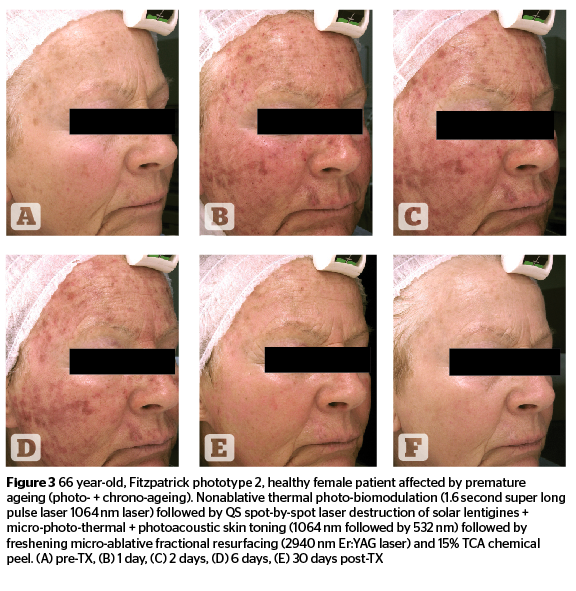 Photo-thermal hormesis, focusing on Fp fibroblasts and basal keratinocytes, associated with the elimination of irregular pigmentation, and a faster, more synchronized epidermal turnover, can effectively slow down clinical signs of ageing. These treatments are associated with most of the other ‘softer’ anti-ageing techniques, like selective facial bio-remodeling with botulinum toxins, volumization with HAs and other bio-compatible fillers, regenerative PRP and bio-mimetic peptides treatments, topical antioxidants, and UV protection. Widespread awareness of the potentially beneficial effects of laser and medical light sources to temporarily reverse, slow down, and prevent clinical signs of skin ageing, has prompted socially active individuals worldwide to seek specialized anti-ageing advice to take maximum advantage of these continuously evolving technologies. 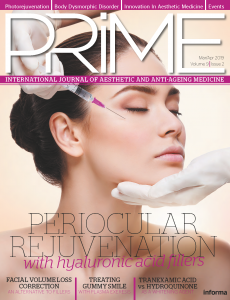 Light energy modulation, fractionation, and combinations have revolutionized light-based rejuvenating procedures, moving from highly effective, aggressive treatments — associated with prolonged down time, relatively important side-effects, and potentially unpleasant complications — to more gentle approaches, with minimal downtime, side-effects, and potential complications. Clinical results are less dramatic but multiple personalized procedures, periodically scheduled along each patient’s ageing path are able to provide a more ‘credible’, elegant, healthy ageing.